A Well-Feathered Nest: I may have found it. When we got married, we ended up with 8 place settings of our everyday dishes which could be found everywhere at the time. I liked them because I knew white would go with anything, and because I thought we could add new pieces any time we needed them. A few of the plates have been replaced over the years, but it seems like the dishes have dropped off the face of the earth since the last time I was looking for some. I think we have about 6 full settings left at this point, and all I've been able to find info about anywhere is the bakeware which is still alive and well--no record of the dishes. I even looked online at Replacements Ltd. and ebay. Anyway, I have been frustrated by this because I'm thinking I could deal with moving on to something different--especially since I hope we won't be moving any time soon, and I actually have space to store kitchen things now. BUT how do you find something that you'll be able to get more of if you need it. I don't want to pick something else that will disappear in a couple more years. I want something that will hold up well to begin with, too. Plus, I don't really want to have to sink a ton into replacing an entire set all at the same time. I have really only been looking casually because it's not really at the top of my "really need to buy" list, but you know how I said we stopped by Belk to pick up a wedding shower gift yesterday? It's been ages since I actually looked at anything in the whole housewares section of a department store. But something did catch my eye. 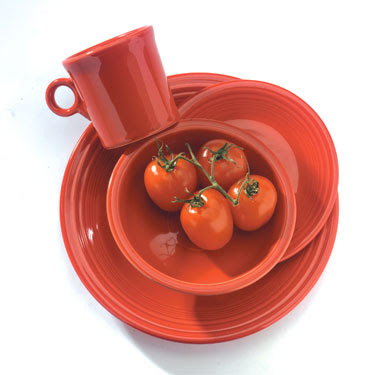 Fiestaware! Peacock and scarlet. I've never really looked at it before, but I've read good things about how it holds up. It is a bit pricy for everyday stuff (in my world, anyway), but apparently it is on sale right now. I don't know if that's why they had a big display out, but these two colors definitely caught my eye. But I don't really NEED new dishes. OK. Just ignore me. It's been a few days with only a 4-year-old for conversation, and he didn't seem too excited by the dishes. I know what you mean. Every set of dishes I have has been discontinued. Don't get anything by MICASA, because they only make stuff for a short while. I wonder what happened to my original plan to have no matched dishes, just mix it up? 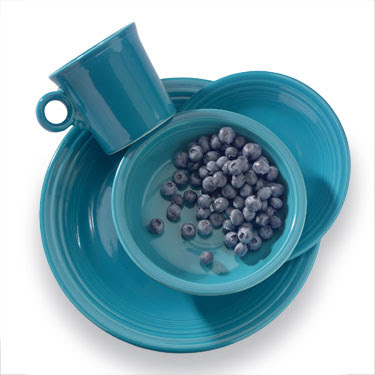 Would your white dishes look good mixed with a few of those pretty colored dishes?